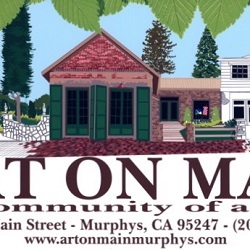 Art on Main is a contemporary fine art gallery offering original art and fine art reproductions, including oils, watercolors, pastels, acrylics, etchings, photography, sculpture, glass, textiles, and jewelry. Also featured is a large collection of original and printed note cards, ready for sending or framing. Artists who display their art also meet and greet the public, providing personal knowledge of the artwork and their fellow artists. Whether considering adding to your own collection, bringing home a memento of Murphys and the foothills, or buying gifts for family or friends, Art on Main has a large and varied display of beautiful items for the discerning buyer.